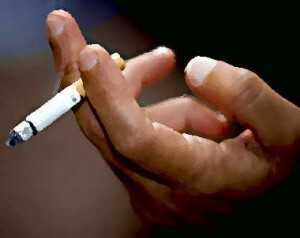 Research shows that contingency management (CM) can promote smoking cessation. However practical limitations, particularly accessibility to treatment among underserved populations, exist. The present study examined the feasibility and preliminary efficacy of using a mobile CM intervention with underserved smokers. Participants used a smartphone app to submit two video samples per day showing the breath CO procedure, and they earned monetary consequences contingent on evidence of abstinence. Recruitment for this study took place in the Emergency Department at Cooper University Hospital, as well as handing out flyers. Recruitment was difficult for this intervention. Overall, there were 65 potential participants for the study. Of that 65, 10 qualified, 34 did not qualify, and 21 never completed the screening process (i.e. no interest). Of the 34 participants who did not qualify, some individuals did not meet the definition of underserved (n=11), others did not own a smartphone (n=8), some did not smoke enough (n=4), while the rest did not qualify for various other reasons (were visiting from out of state, substance abuse, chew tobacco use rather than cigarettes, asthma, no avoidance of smoking in the home environment during the duration of the study, etc.) (n=11). Of the 10 participants who were screened and met the qualifying criteria; six enrolled and four either lost contact. Of the six participants enrolled in the study, one decided not to participate and returned the equipment prior to beginning with the baseline condition, two participants never followed through after intake and were lost to contact, and one participant decided to end on day four of the baseline condition due to life events. Only two participants completed the study, (CED300 and CED800). During the 4-day baseline phase both participants were 100% compliant with their video samples. During the shaping period, CED300 was 100% compliant, while CED800 was 75% compliant. Finally, during the 10-day treatment period, CED300 was again 100% compliant with their samples while CED800 was only 20% compliant. Both participants submitted their lowest CO’s during the treatment phase and while they both cut down smoking, neither of them quit. We experienced many difficulties recruiting for this intervention with this particular population. In the future adaptations need to be made to address the unique needs of this population in order to fix some of the obstacles we encountered in recruitment. This entry was posted in Mental and tagged Smokers, Underserved on 15/03/2018 by Mary.